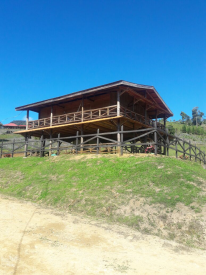 Timber-frame, nearly new 2 story all wood cabin on 7 plus acres (3 hectares) in the high mountains above the small town of Pejibaye. Cabin has 2 bedrooms and 2 baths. Kitchen with rustic natural wood cabinets The first floor is mostly open except for the tiled bath. Cabin is made from Pilon wood and native pine siding with a metal roof. 100 small pines planted for Christmas Trees. Street lights. Electric and water available. Pura vida- Pure life as well as fresh air and pure water. The farm is lots of pasture, some pines and other native trees. It is fenced and cross fenced. The area is so quiet and private. The next farm over is owned by a retired professor. Very near Tapanti National Park. You can see Cerro de Muerte ( highest peak in Costa Rica) from here. Elevation is 1250 meters approx. 4100 ft.